Why Caesar have chosen this semi-renacentist style for their boxes? beats me. 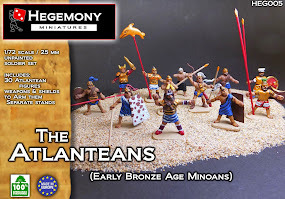 I have been actually convinced not to buy some Caesar sets just by the awful box art. But in this case, they could have given me a blank box and I would have bought them anyway. The only positive point about the box art is that makes Caesar Miniatures recognizable. The box art shows many poses which you don't get, and gives you the sensation that you are buying a bunch of rebels with just spears and slings. Nobody beats Caesar on details -you should know that!- and although there is a couple of weird poses or anatomical movements, it gets a quite high valoration. 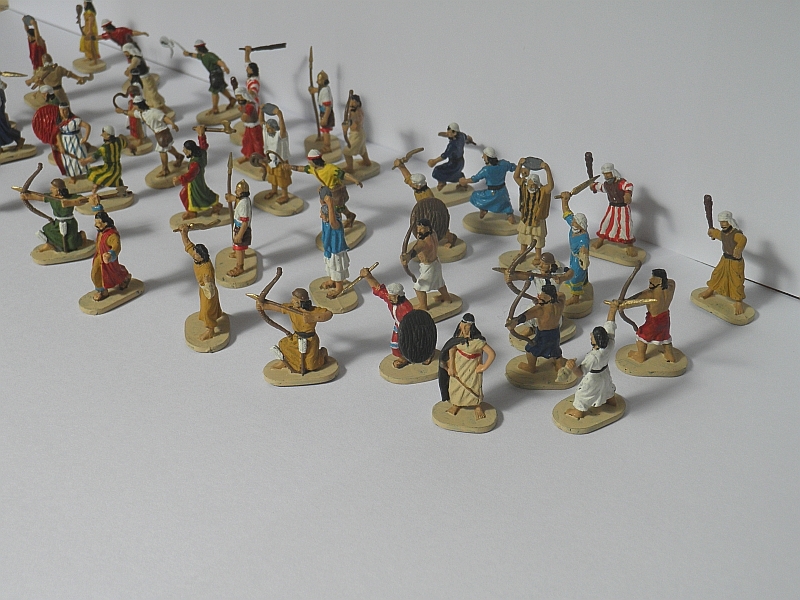 The height is strictly 1/72, which is very appreciated in these times were nearly all miniatures are "growing". All the details are fantastically clear and sharp. You don't have to guess what they are wearing or were the sleeve starts or whatever, you can clearly see it. The man advancing whilst jumping, (the second last figure in the pic above) is holding a weapon, but none of the weapons given seem to give a good impression. One could say that the musculature in the archer seems exaggerated .They hadn´t put a foot in a gym in all their lives, so I am ok with that. 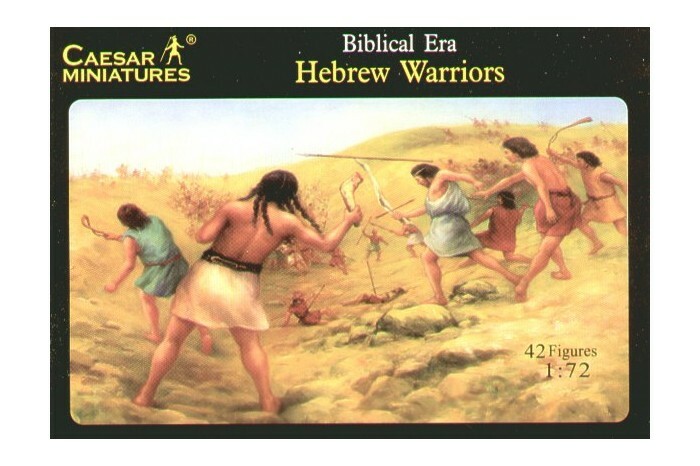 Don´t get me wrong, there isn't anything like "that is a greek helmet" " or a hebrew warrior never carried thasort of shield", but the set tries to capture the first wars of the Hebrews till the revolts against the Romans. That is about 3000 years, and is tiny bit too much. Some are soldiers, other civilians or if you prefer rebels. Each figure should be really analyzed. The leader depicts Samson (why him and not King Solomon or King David escapes me), which fought only with the jawbone of a donkey and killed thousands of Philistines (quite impressive, for a donkey jawbone). The female figure seem to represent Delilah, although you are given 4 of them. The figure with seashell also seems to represent a historical character, and you could hypothesize that the old man hurling a stone is indeed Moses, although in my opinion he is a rebel Hebrew throwing a tile at the Romans as in the Ben Hur film. Oddly, you are not given 2 unique figures as normally with Caesar, instead we are given two palace guards, the only regular troops we can spot here. Another ahistorical thing, is even if the figures seem to fit better with being rebel Hebrews, they are given bronze age weapons and not a single spear besides the two palace guards, so here you will need to have a good repertoir of weapons to make them a realistic Masada army. Finally, the man with the mace seem a arab bedouin, which doesn´t seem to fit here. 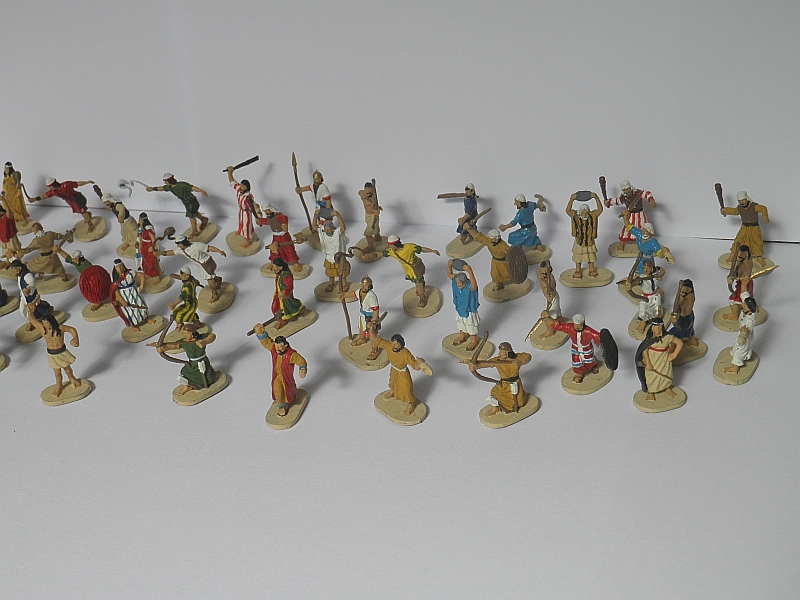 If we leave out a couple of figures, this set will be better used as Hebrew Rebels during Vespasian or Titus' reign. This set gives you endless possibilities about making Middle East armies, at least half of them could be very useful for making Assyrian auxiliaries,or you could use them to make Phoenicians, Mitanni light infantry, Babylonian auxiliaries, and many, many more. Both archers could be used for hundreds of armies and civilizations. "I feel that many reviews are oblivious to this point - there are fantastic figures, which you can´t say anything against, but they are just too "correct", maybe too static, and so just boring. So I feel that this is an important slant on deciding if you buy this set"
This set is strong on funness. The hero Samson, the man hurling a stone, the man with the seashell, makes if a bit strange set a quite fun one. 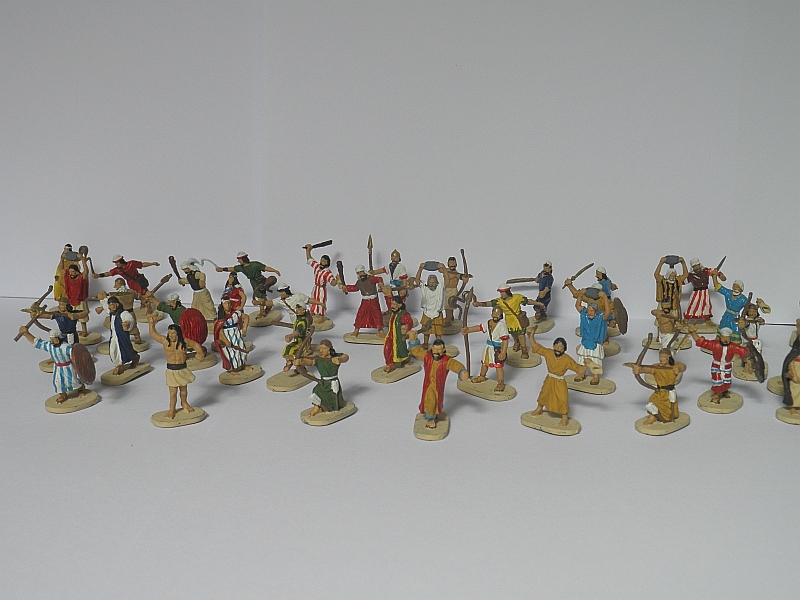 Although one could say also that the theme could give even more fun figures, like a King Solomon, a Herodes, prophets, or many more. You are given a leader, which is always nice, but for the rest the heterogenic nature of this set doesn't work very well with wargaming. 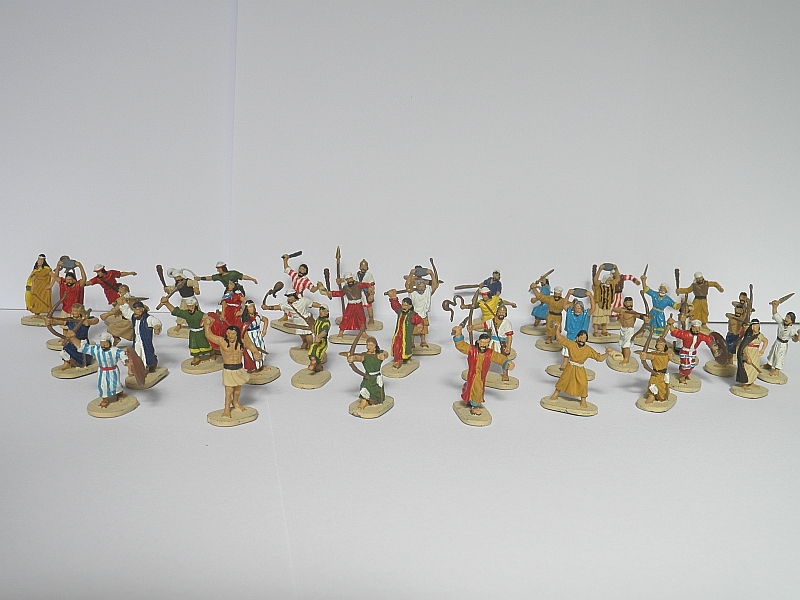 I mean, a stone hurlers unit wouldn't be useful, although it will be excellent for a diorama. You should be given more ordinary troops like the two palace guards, in different poses, etc. I had to pay at that moment (some years ago) a whooping 12 € for them (at that moment, the most expensive 1/72 figures that were available), as usually in retail stores, they are very expensive. But in eBay, they are quite affordable, like 10 € or less, and having the quality they have, it is worth the money. As can be said for all Caesar, the plastic is a sort of rubber that is rough and not slippery.Even if still a bit too dark maybe, a lighter grey would have been better. They can be nicely glued. A bad thing is that they come many times with bent lances or bent bases,( which in theory can be solved with hot water ), although many return to their bad poses again. It is overall a very nice set, and as with 99 % of Caesar sets, worth having. Sadly I don't know, but I think there should be something out there. 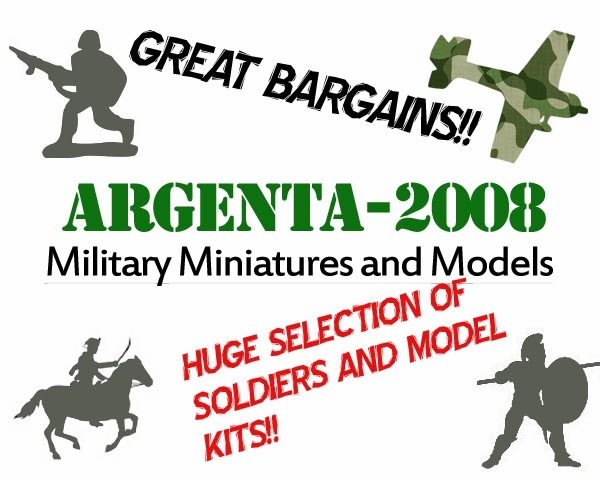 You can try searching for soldier lots on eBay and see if something appears. 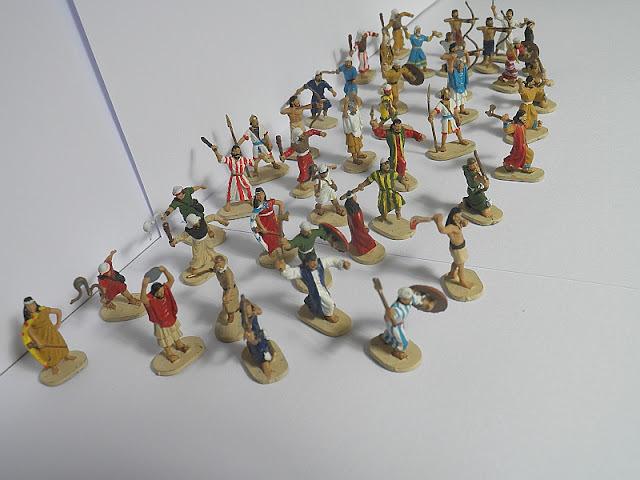 The other options are to make aconversion of HaT's Carthaginian Infantry, which they could look similar, or search for crib figures which they might be in similar scale.